(2014). Synthesis of Iron Oxide Nanoparticles using Borohydride Reduction. International Journal of Bio-Inorganic Hybrid Nanomaterials, 3(4), 203-206.
. "Synthesis of Iron Oxide Nanoparticles using Borohydride Reduction". International Journal of Bio-Inorganic Hybrid Nanomaterials, 3, 4, 2014, 203-206. (2014). 'Synthesis of Iron Oxide Nanoparticles using Borohydride Reduction', International Journal of Bio-Inorganic Hybrid Nanomaterials, 3(4), pp. 203-206. Synthesis of Iron Oxide Nanoparticles using Borohydride Reduction. 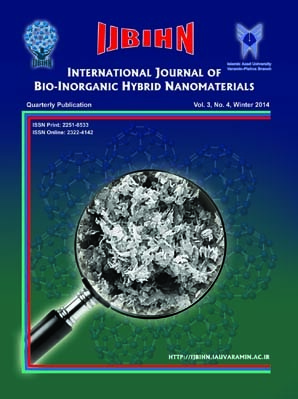 International Journal of Bio-Inorganic Hybrid Nanomaterials, 2014; 3(4): 203-206. Iron oxide (Fe2O3) nanoparticles were synthesized by a simple approach using sodium borohydride (NaBH4) and Iron chloride hexahydrate (FeCl3.6H2O). Their physicochemical properties were characterized by high resolution transmission electron microscopy (HRTEM), scanning electron microscopy (SEM), X-ray diffraction (XRD) and electron dispersive spectroscopy (EDS). XRD pattern showed that the iron oxide nanoparticles exhibited rhombohedral structure and gamma-Fe2O3 (maghemite) to alpha-Fe2O3 (hematite) structural phase transition in nanocrystals. The particle size of α-Fe2O3 was around 28 nm in diameter as estimated by XRD technique. The surface morphological studies from SEM depicted spherical particles with formation of clusters by increasing annealing temperature. The EDS spectrum showed peaks of iron and oxygen free of impurity.